Q1. Which regular, long-time cast member of Bonanza wore a hairpiece (toupee) during the 14 years that the series was on the air (from 1959 to 1973)? Q2. Which of the original Bonanza cast members appeared in any of the 3 made-for-television Bonanza movies between 1988-1995? Below, "The Avenger" episode of Bonanza aired in 1960 and featured guest star Vic Morrow as Lassiter. Bonanza was one of the first television series that the baby boomer generation was able to view in colour, and was the first series to rank in the Top Five TV series for 9 consecutive years, not falling out of the Top Ten until 1971. The western series focused on the Cartwright family and life on their Ponderosa ranch. 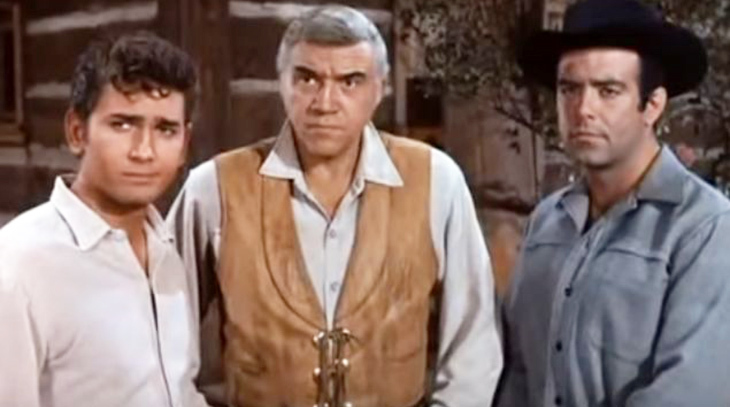 Bonanza won the Primetime Emmy Award for Outstanding Dramatic Series in 1966. Canadian actor Lorne Greene played widowed father Ben Cartwright during all 14 seasons of Bonanza. Greene was 44 when Bonanza began in 1959, and well into his 50+ years when the series ended in 1973. Lorne Green was divorced from his first wife Rita Hands in 1960; their children, daughter Belinda and son Charles, were twins born in 1945. The following year Greene married Nancy Deale and their daughter Gillian was born in January 1968. Greene won the 1964 Golden Globes Award for Best TV Star Male for his work on Bonanza. 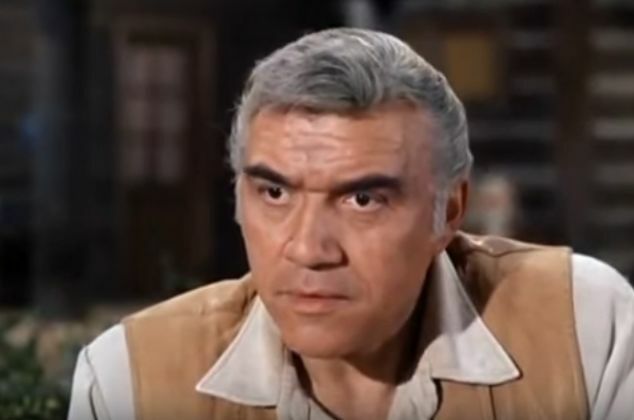 Lorne Greene continued to worked steadily in television after Bonanza went off the air in 1973, appearing in the miniseries Roots (1977) and as a regular cast member Commander Adama in Battlestar Galactica (1978) and Galactica 1980 (1980). Lorne Greene was a septuagenarian senior citizen when he died from complications from pneumonia after ulcer surgery in September 1987 at the age of 72. A Georgia native, actor Pernell Roberts was in his 30's and divorced from first wife Vera Mowry (with whom he had son Jonathan Roberts) when he portrayed the oldest Cartwright son Adam for the first six seasons on Bonanza from 1959 until the end of the 1964/1965 season. During his time on Bonanza, Roberts married second wife Judith Anna LeBrecque in October 1962. His character of Adam Cartwright was written out at his request; Roberts left Bonanza to return to acting on the stage, his first love. Pernell Roberts guest starred in countless television series during his long career including The Love Boat, Hawaii Five-O, The Hardy Boys/Nancy Drew Mysteries, Perry Mason, and The Six Million Dollar Man, before starring in the popular baby boomer series Trapper John, M.D. (1979-1986). Roberts divorced Judith in 1971 and married third wife Kara Knack in 1972; they divorced in 1996. Pernell Roberts had been married to his fourth wife Eleanor Criswell for almost 20 years when he died from pancreatic cancer in January 2010, an octogenarian senior citizen (age 81) - the last surviving original Bonanza regular cast member. Middle Cartwright son Hoss (Eric) Cartwright was played by 6'4" former university football player and high school drama teacher (Bobby) Dan Blocker. Blocker was the same age as Pernell Roberts when Bonanza began airing in 1959. Blocker was married to his wife Dolphia Parker from 1952 until his death at age 43 in May 1972 from a pulmonary embolism after gall bladder surgery; he and Dolphia had 4 children - Dirk, David, Debra and Danna Blocker. In 1965 while Bonanza was still on the air, Dan Blocker started the first Bonanza Steakhouse chain restaurant, which later merged with the Ponderosa franchise. 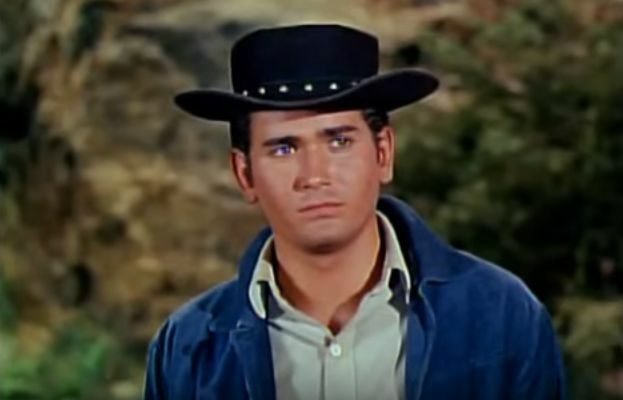 Michael Landon was 23, married to first wife Dodie Levy-Fraser (m. 1956), and a father to adopted son Mark Landon, when he began playing Little Joe Cartwright on Bonanza in 1959. Landon and Dodie adopted baby son Josh Landon in 1960. In addition to portraying the youngest brother/son on Bonanza. During his time on Bonanza, Landon began to write and direct episodes of the series. During the run of Bonanza, Michael Landon divorced Dodie in December 1962 and married Marjorie Noe in January 1963. Michael Landon and Marjorie had five children altogether - Lynn's daughter Cheryl (from her first marriage), daughter Leslie (b. 1962), son Michael Landon Jr. (b. 1964), and daughter Shawna (b. 1971); and son Christopher, who was born in 1975 after Bonanza had ended. Landon and Marjorie divorced in 1982 and he remarried for the third time in February 1983, to his Little House on the Prairie (1974-1982) television series makeup artist Cindy Clerico. Michael Landon and Cindy had two children, daughter Jennifer (b. 1983) and Sean (b. 1986). From 1984-1989, Landon starred on the popular baby boomer television series Highway to Heaven as angel Jonathan Smith. Landon was a heavy drinker and chain smoker, and died in February 1991 in his 50+ years from pancreatic cancer, the same disease that took his on-screen Bonanza brother, Pernell Roberts. 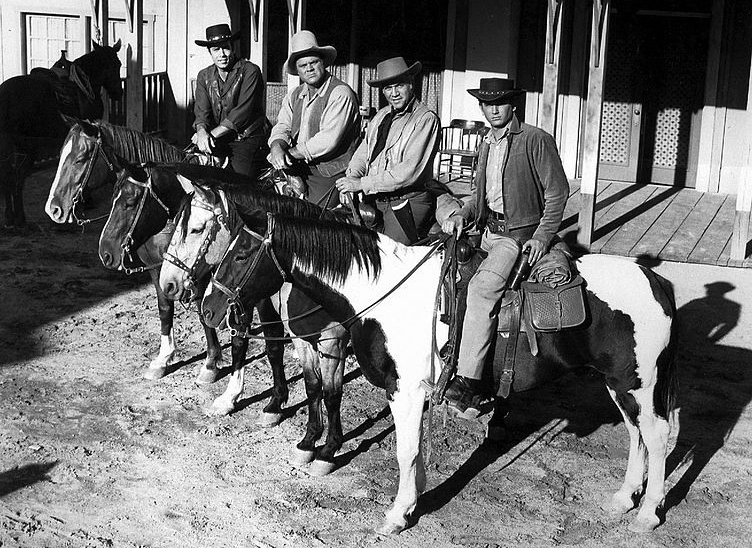 Below, members of the Cartwright family on Bonanza, from left: Sons Adam Cartwright (Pernell Roberts), Hoss Cartwright (Dan Blocker), father Ben Cartwright (Lorne Greene), and Little Joe Cartwright (Michael Landon). A1. Lorne Greene and Pernell Roberts wore toupees throughout their entire run on the series; Victor Sen Yung (Hop Sing, the cook on the series) wore an attached queue. 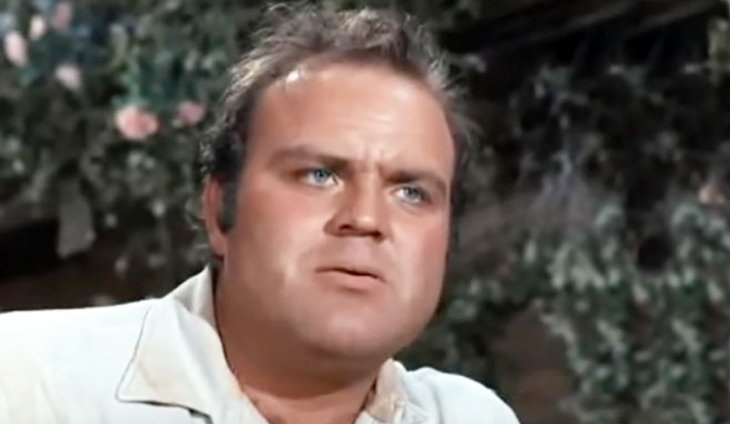 Dan Blocker began wearing a toupee in 1968 when he began losing his hair. Victor Sen Yung was a senior citizen when he died in November 1980 at the age of 65. A2. With the exception of Michael Landon and Pernell Roberts, all of the original Bonanza cast members had died by the time the first Bonanza movie - Bonanza: The Next Generation (1988) - was filmed, and neither Landon nor Roberts appeared in the movie. Landon's son Michael Landon Jr. played Little Joe Cartwright's son, Benjamin (Benji) Cartwright, and Lorne Green's daughter Gillian Greene played his love interest Jennifer Sills in the movie. The cast of Bonanza: The Return (1993) included Michael Landon, Jr. again, as well as Dirk Blocker, Dan Blocker's son. Michael Landon Jr. appeared in the third movie as well - Bonanza: Under Attack (1995).